Member of ABOR (Austin), MetroTex (Dallas), HAR (Houston), and SABOR (San Antonio), area local Boards. Full broker support and training. Back office transaction management system provided. Sales Associate keeps 100% commission for all transactions – sales, leases, apartment locating. No Annual Fee or any others – E&O is included. 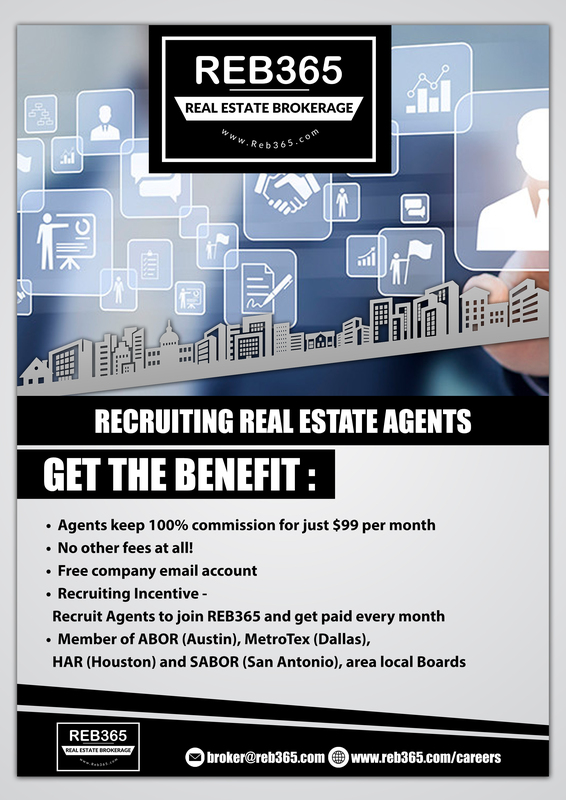 Recruiting Incentive – Recruit Agents to join REB365 and get paid every month. Many people don’t like change. However, you wouldn’t be on this page if you weren’t contemplating a change in brokerages. There must be a reason you want to switch. Rest assured that we are committed to making a transfer to REB365 as easy as possible. New agents are welcomed! Must have an entrepreneurial mindset. You are an independent contractor – YOU are your own business. Full broker support; will train; and look at every contract for accuracy. Will never leave you hanging. Towards the bottom of the page find the blue box called ‘My License Services’. If never been here, register for an ID by clicking that link provided. Finish the payment process and your sponsorship request will be sent to us. Cost is $20.60 to TREC for processing this online. If you process a paper form, it takes longer and the cost is $40. Much more efficient to complete this online. After TREC license is activated/transferred to REB365, next step is to get the local real estate board established (for new agents) or switch your broker affiliation if you are already a member of the board. We’ll show you how to do this.